This week, from today until next Friday, in celebration of absolutely nothing I've put my novel, Shining in Crimson on sale for 99 cents for the Kindle edition and $6.99 for the paperback edition! So, if you don't have it yet, or if you want to get it as a gift for a friend or family member, or maybe you have the Kindle edition and you'd like a nice pretty trade paperback copy to put on your bookshelf, here's your chance to get it for cheap. Feel free to spread the word to those out there in internet and/or really-real land. As for those still waiting for Fading in Darkness, I wish I could give you better knews than this, but I'm still working on it when I get time. Unfortunately, lately, time is the most elusive of commodities for me. But I'm hoping to have the cover to reveal soon and some other work coming out in one form or another. I'll update in more depth soonish (if we're lucky that won't be my typical version of soonish, i.e. cobwebs on skeletons and such). So, with that, I must be off. 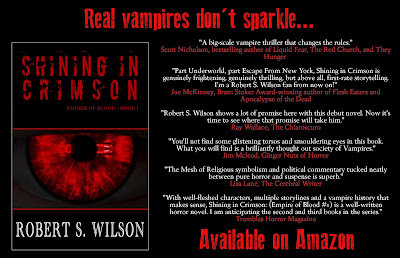 I only ask that if you enjoyed Shining in Crimson or any of my other works and would like to help spread the word please be so kind as to share the image below and the news of my week-long sale on your favorite social networking site, or with a friend you think might be interested, or print it out and wear it as a cape as you stroll through the city screaming out passages of my work if you so choose. Okay, maybe that's just a tee tiny bit over the top...maybe. But you get the idea. Until next time, thanks for reading and thanks for the support! Did I Ever Tell You About The Time I Started A Publishing Company And Then Was Never Able To Get Anything Done? So, I guess I should start this post out by admitting I was a little bit disappointed that the Kickstarter pretty much fizzled out. And between that and being piled over with freelance editing work and a large array of duties for Nightscape Press, I've pretty much put a slowdown on writing for both FADING IN DARKNESS and EXIT REALITY. Thanks to all I have going on, it seems every time I would come back to one or the other, I'd have to spend long periods of time rereading prior material just to figure out where the hell I was. So, instead, I've been writing short stories. Not a ton mind you as I've not had much time even for them, but I've finished a few and have probably five or six partially finished. But I've been exploring some different things with these short stories. Anything from things in my life that I keep very close to myself all the way to weird off-the-wall concepts like alien centipedes taking over human bodies. Some of these stories are fun and some of them are the hardest things I've ever tried to write. Will these stories see the light of day? That's yet to be seen. I'm sending them out to various magazines and anthologies. One of these stories has been accepted. 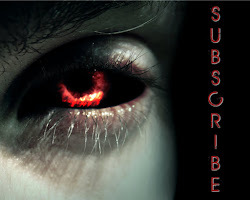 A flash story entitled THE LAST TIME I SAW MY BROTHER NATHAN will be appearing in the upcoming zombie anthology A QUICK BITE OF FLESH from Hazardous Press alongside several friends/authors I highly respect. But alas it's come time for me to get back to work on my longer projects and I do plan on making EXIT REALITY my biggest writing priority. And then once it's done, FADING IN DARKNESS will take its place. In other news, we at Nightscape Press have released our first three titles, A REQUIEM FOR DEAD FLIES by Peter N. Dudar, BUTTERFLY POTION by Trent Zelazny, and WORLD'S COLLIDER edited by Richard Salter. All three are amazing books I highly recommend anyone and every one consider checking out! In fact, A REQUIEM FOR DEAD FLIES has even already made the Horror Writers Association's Bram Stoker Award™ 2012 Reading List. 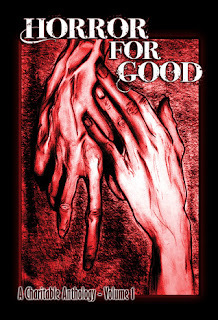 Speaking of, another great title to have made this list is HORROR FOR GOOD: A CHARITABLE ANTHOLOGY edited by Mark C. Scioneaux, RJ Cavender, and myself and published by Cutting Block Press. We're all very excited to see these two titles make the list.